serving as a preview of the material to appear in a forthcoming book. The mutual respect among people of different socio-economic statuses in non-communal intentional communities creates the peace of class-harmony, as opposed to a disrespect leading to the violence of Marxist class-conflict. The correlation in reality: Jesus of Nazareth (the inspiration for Christianity), Robert Owen (English advocate of the early cooperative movement in which the term “socialist” originated in 1827), and Charles Fourier (French utopian writer who advocated a “formula for the division of profits among capital, talent, and labor” see: Edward Spann, 1989, Brotherly Tomorrows, p. 165) all showed that community does not require economic equality among people. “Class-harmony community” accommodates people of different social-economic statuses living and working together. Jesus, or those who created Christianity, along with Owen, and Fourier got it right! Intentional community, in which people deliberately define and live common values, as opposed to circumstantial community where people happen to live in proximity by chance, illustrates the “communal sharing theory,” which states that the greater the experience people have of sharing and/or gifting, the greater will be their commitment to the community thus formed. The correlation in practice: Sharing and gifting involves material objects as well as thoughts, beliefs, feelings, emotions, leadership, and power, the practice of which builds resilience for survival of the community’s unique identity. It is through practicing gifting and sharing in many different formats that the communities movement is continually growing, differentiating, and evolving. Labor-gifting is used in communities which involve the sharing of privately-owned property, like cohousing and class-harmony communities, and labor-sharing is used in communities which involve the sharing of commonly-owned property, specifically communal societies. Intentional communities having both private and common property, like community land trusts, may practice any form of time-based economy: labor-exchanging, labor-gifting, labor-sharing. The “communal privacy theory” states that increasing levels of privacy, afforded by resources or powers entrusted to individuals (called “trusterty”), does not reduce communalism as long as the ownership and responsibility remains under communal ownership and control. The “cofamily” affirms and expands the options or possibilities of human culture beyond the common forms of the family of single-parent, nuclear, extended, and blended families, to include small groups of adults in community who are not related by blood or marriage. The correlation to practice: A “cofamily” (which may also be called an “intentional family”) is a small community of three-to-nine adults with or without children, with the prefix “co” referring to: collective, complex, cooperative, convoluted, communal, complicated, conflicted, or any similar term, except consanguineous. A cofamily may or may not be a group marriage, as in the plural-conjugal structures of polyamory and polyfidelity. A cofamily may stand alone as a small intentional community or be part of a larger community such as cohousing or a communal society as a “nested cofamily” (sometimes also called “small living groups” or SLGs) whether comprised only of adults or formed around the care of children or those with special needs. Correlations in community: Some parents prefer that or believe that in some cases “communal childcare” can or should replace the family, whether single-parent, nuclear or patriarchal, extended, or blended. Generally, communal childcare in small groups, named by the present author “cofamilies” [see: 5. Cofamily versus Consanguineous Family] can and does work well, while communal childcare in large groups of ten or more adults, where the parents give decision-making power over their children to the group of child care-givers in everything from diet to vaccinations to education to discipline, is problematic for the adults when some have difficulty in making and keeping agreements. While the adults have trouble with conflicts among the child care-givers, the children are usually doing fine, as long as they sleep with their parents rather than away from their parents in a communal children’s house. There are two main problems with communal childcare in large groups, first, a lack of consistently high-quality childcare as care-givers with different skill levels come and go. Achieving agreement on the many issues presented in the previous paragraph creates such a bureaucratic cost in meeting time that focusing upon the developmental needs of each child is often lost (see: Ingrid Komar, Living the Dream, p. 240). While more meetings scheduled specifically for addressing each child’s development may be called for, increased time in meetings begs the questions of diminishing returns and commitment to the ideal. Especially given the turn-over in child care-givers, the parents usually end up having the most consistent relationship with their children, which can lead to parents disregarding community childcare policies with which they disagree, resulting in the failure of at least the communal childcare program, and sometimes the community itself. It is because of the problems of children in communal society that the present author asserts the provocative conclusion that “large-group communalism has an inherent bias against children when parents cede decision-making over their children to the group.” Parallels to this can be seen in the dominant, outside-world culture where conservative governments seek to avoid providing social services to families with children. In contrast, cohousing communities which practice the sharing of privately-owned property as opposed to commonly-owned property, and labor-gifting as opposed to labor-sharing, actively advertise for families with children to join the community, while secular communal societies usually do not. In fact, some members of FEC groups have left communal society to join a cohousing community where they then raise their children. In community people clearly see that we are all in this together, while in the monetary economy it is understood that everyone is in it for themselves. The correlation to experience: Time-based economies, whether labor-exchanging (e.g., Time Dollars), labor-gifting (e.g., volunteering, “giving back,” and “paying it forward”), or labor-sharing (i.e., whether anti-quota or vacation-credit labor systems), by valuing all community-labor equally no matter what is done or who is doing it, provide freedom from the alienation of monetary economics. The well known Morelly’s Maxim written in the 18th century of “from each according to ability; to each according to need” is now updated in the 21st century to apply to groups as opposed to individuals by the present author in Allen’s Aphorism as “from all according to intent; to all according to fairness.” Ability is to intent; as need is to fairness. When Marx and Engels sought to define a future ideal culture to supersede market capitalism they had the same trouble as everyone else in projecting the details of what it would look like and how it would function. In the Intentioneers.net blog post “Understanding Non-Monetary, Time-Based, Communal Economics” the present author wrote that with the innovation of the vacation-credit labor system the egalitarian, secular, communal intentional community Twin Oaks has solved the problem of Karl Marx’ and Freidrich Engels’ second phase of communism. Membership entitles the person to all the goods and services of the community, with distribution organized in appropriate ways, such as: equally to all, according to need (e.g., health care), by chance (i.e., dice, straws, etc. ), first-come-first-served, or by preferences matrix (see: Komar, 1983, Living the Dream, pp. 113-4). Merit is used for assigning committee and managerial positions, while seniority is rarely acknowledged in egalitarian communities. For ten years the egalitarian communities experimented with variable-credit labor systems, compensating different types of work with different credits-per-hour depending upon people’s preferences, until the members decided they preferred to value all work benefitting the community equally, thus respecting Daniel Gavron’s red line between communalism and the exchange economy. This design of a communal economy has now been in use over fifty years, with all of the known communities using variations of the system associating in the Federation of Egalitarian Communities. When the irresistible force of personal needs hits the immovable object of the attachment to communal ideals, a cognitive dissonance results of people doing one thing while saying something contradictory about exactly what it is they are doing. The correlation in community: For about a decade East Wind Community, about a quarter-century Twin Oaks Community, about sixty years the Kibbutz movements, and for probably a few centuries the Hutterite colonies, all struggled to make something work that tends to not work well in large communal societies; designing and maintaining communal childcare systems in which the community rather than the parents make all the decisions for the children. [See: 6. Family or Cofamily-Based Childcare versus Large-Group Communal Childcare] In many cases the community sentiment is essentially that of course a communal society must have a communal childcare system, while typically the children who grow up in communal childcare systems refuse to raise their own children the same way, resulting in their leaving the communal society to have children and sometimes causing the communal community itself to privatize or disband. Conflicts reoccurred over the years as non-compliance was met by social pressure, yet parents continued to ignore the rules they disliked. Eventually it was social anarchy that ended communal childcare at Twin Oaks, while at East Wind the story was similar yet more intense, with those most committed to communal childcare giving up and leaving. Despite the commitment to participatory governance, the story of communal childcare in the larger Federation communities shows how group-think can maintain commitment for a limited amount of time to a hopelessly failed ideology while policy dilemmas seem to never go away. Social pressure reinforced the status quo, while non-compliance with childcare agreements resulted in an example of social anarchy within a bureaucratic system. While America is generally described as a “capitalist country” the dominant culture is actually fairly well balanced between the aspects of competition and of cooperation. The theory of “parallel cultures” as developed by the present author says that the two economic systems are intertwined or interwoven, such that the debt-based monetary system and the non-monetary time-based system are mutually dependent. Although the monetary system gets all the glory (via economic metrics such as GNP/GDP), the fact is that industrial, agricultural, governmental and all other forms of production are dependent upon the uncounted labor which provides domestic and community services, usually performed by women. If the non-monetarily-compensated work in domestic reproduction, often called “women’s work,” were to be monetized, it would add significantly to the country’s GNP/GDP. As it is, the corporate/private and government/public world is dependent upon the non-monetized domestic labor of women and men for the raising of each generation of wage-earning and salaried employees. In her 1991 book Paradigms in Progress: Life Beyond Economics Hazel Henderson calls domestic gifting and sharing labor the “informal economy of unpaid productivity” (Henderson, pp. 120-2). Marilyn Warring explains further in her 1988 book If Women Counted: A New Feminist Economics, that “the international economic system constructs reality in a way that excludes the great bulk of women’s work—reproduction (in all its forms), raising children, domestic work, and subsistence production. Cooking, according to economists, is ‘active labor’ when cooked food is sold and ‘economically inactive labor’ when it is not” (Waring, pp. 30-1). Defining economics as the total production of goods and services, in the nation-state monetary economics is less than half of the economic story. The gifting and sharing part of our economic system includes three main components, two that use money and one that is time-based. The gifting and sharing parts of the U.S. economic system are comprised of: • Government spending [the first monetary-sharing part] including federal, state, and local equaled about 34 percent of U.S. Gross Domestic Product (GDP) in 2015 (see: http://www.usgovernmentspending.com). • The economic contribution to GDP in 2014 of tax-exempt organizations [the second monetary-sharing part] comprised 5.3 percent (see: nccs.urban.org/data-statistics/quick-facts-about-nonprofits). • A United Nations survey titled The World’s Women: Trends and Statistics, 1970-1990 reported that if time-based domestic economic production [the gifting and sharing part] was monetized, the U.S. GDP would be 30 percent higher (Henderson, 1991, pp. 11, 167). Since it is not monetized this “domestic reproduction” contribution to GDP is uncounted, invisible, and disrespected, while being essential to the monetary system. The correlations in community: Justification for the “parallel cultures” concept is found in three surprising aspects of the counterculture, where people who are committed to alternative lifestyles actually end up engaging in at least three activities which constitute the basic building blocks of monetary economics. It is astonishing to think that by returning to pre-monetary gifting and sharing lifestyles people naturally end up recreating and reliving the basic dynamics which apparently led to the foundations of monetary economics in human civilization! • First is the issue of children in communal society, where as explained in an earlier section of this paper [6. Family or Cofamily-Based Childcare versus Large-Group Communal Childcare] people typically leave the secular communal society they previously joined, and in the case of East Wind Community they are sometimes forced out (as was the case with the present author and others), to rejoin the dominant, monetary system in order to have children in a family setting, whether single-parent, nuclear, extended, or blended. In other cases people simply avoid joining communal society in the first place when they choose to focus upon personal needs and wants over idealistic values [see: 1. Idealism versus Self-Interest]. Further, even if children do grow up in communal society they will typically leave once they become adults in order to take their chances in the dominant, monetary economy and society. The dynamic here seems to be that adults usually want something different than what they had growing up. Just as those who grow up in the country often want to move to the city, and those born in the city want to get back-to-the-land, so also do those who grow up in communalism want to explore the monetary system, while those who grow up in the dominant culture want to become part of its counterculture. It may be that youth always wants to take the dragon by the tail, as it were, and see how well they can make it serve their own interests and ideals, or it may simply be the case that the grass always looks greener in the parallel culture on the other side of the looking glass. • Second is the case of the wilderness training experiences in basic market economics provided at the countercultural gatherings of the Rainbow Family of Living Light. A standard feature of Rainbow Gatherings, large and small, is the Trade Circle or Barter Lane. At Rainbow Gatherings private property is used in two ways: in gifting and in trading. All Annual and most Regional Rainbow Gatherings happen on government land, like national forests and other wilderness areas. Primarily the Gatherings focus upon gifting of labor and food from the individual to the group, yet to the dismay of many Rainbows, a large number of attendees insist upon spreading a blanket on the ground and displaying all manner of articles for trade, from camping supplies and clothing to semi-precious stones, crystals, and art and craft work. On warm sunny days hundreds of people will be actively trading, and thousands will wander down Barter Lane enjoying this colorful, bustling milieu of Rainbow culture. Typically, certain commodities like chocolate and tobacco will take on the functions of indirect-barter, becoming primitive forms of currency. When the value of chocolate in particular inflates too high in the barter market someone will typically purchase a huge bag of the commodity and hand it out at Barter Lane to saturate the market by increasing the supply. Inadvertently, the pleasure-of-haggling results in the teaching of children especially the basic market functions of supply-and-demand, monopoly, market saturation, buy-low/sell-high, and other aspects of exchange economies, within an ostensibly gifting and sharing culture. While similar festivals like Burning Man actively shut down any kind of trade or barter activity, Rainbow culture is too anarchistic to stop such antithetical behavior. Barter at Rainbow is essentially a form of non-compliance with the gifting ideal and intent of the festival, similar to the experience of parents going against the assumptions of large-group communal childcare [see: 6. Family or Cofamily-Based Childcare versus Large-Group Communal Childcare], illustrating again the intertwined nature of exchange versus gifting and sharing parallel cultures, where both opposing cultures actually create their own antithesis. • Third is the experience of communal groups attempting to trade commodities produced in their own businesses with each other. There are two aspects to this dynamic, first being the experience of two groups in the Federation of Egalitarian Communities, both in Missouri. East Wind Community makes nut butters like peanut and almond butter, while Sandhill produces sweeteners like sorghum and honey. The two wanted to trade for the other’s commodities, yet had to work out how best to value their products. Should they trade according to weight or volume, or maybe by how much time was required by the two communities to each make a comparable unit of their products? Then too is the problem that trade in commodities is taxable, just like monetary sales, so the communities would have to keep a special barter ledger to account for their trades. A second ledger for barter transactions then complicates the communities’ computation of the dollar-per-hour of their various businesses which they use to monitor their own productivity over time. Given all these complexities East Wind and Sandhill decided to simply sell their products to each other as they would a commercial account, just to avoid making more work for themselves. Here is seen, in this experience of two of the most radical, non-monetary, time-based, communal societies opting for exchanges between them utilizing monetary economics, another illustration of how and why monetary systems developed at the beginning of civilization. The second aspect of commodities exchanges between communal societies resulting in experiences of the return to monetary economics, illustrates how communal idealism continually results in the proverbial reinvention of the exchange system “wheel.” Arthur and Jane Morgan, cofounders of The Vale community in Yellow Springs, Ohio in 1946, had earlier founded Community Service, Inc. (CSI) in 1940. Alfred Andersen, after his release from detention as a conscientious objector during World War Two, joined them and helped form in 1946-47 an association for barter exchanges of agricultural products and crafts between communitarian settlements called, “Inter-Community Exchange.” Andersen explains, “Our hope was that we could develop an entire alternative economy of trading among cooperative communities. … It was only after a year or two that we realized the main thing we had to exchange was fellowship.” (Andersen, “Fellowship Roots: Where We’ve Been; Where We Might Go,” Communities no. 97, winter 1997, pp.12-13) After the founding of the Federation of Egalitarian Communities at East Wind in 1976 a member of East Wind started a short-lived marketing initiative called “Community Products,” and later in the 1990s a former member of Twin Oaks then living at an associated community created an Internet-based community-market initiative, only to give that up after a few years. With the rise of a number of small communities around Twin Oaks about the time of its 50th anniversary the topic of exchanging and marketing of products made by the various communities has arisen again. None of the people involved in these initiatives have known about the earlier failures, while the same idea has probably surfaced as well at other times in other places, and so this particular market-exchange-system wheel keeps being reinvented, or at least discussed time after time, with the result always being the return to reliance upon the market-economy system of the dominant culture. These examples of how people who have been committed to the communal ideal and have left the monetary economy to live in various types of intentional community, only to end up recreating aspects of monetary systems, even creating community-owned businesses, illustrates how debt-based monetary economics and time-based non-monetary economics function as parallel cultures. The intertwined nature of these two, supposedly diametrically opposed cultures, is perhaps best portrayed graphically in the oriental Taijitu or “yin-yang” symbol, in which two opposite concepts are represented as each having an aspect of the other embedded within them. While such an illustration is not included in this paper it will appear in the book version. Cultural innovations often arise from utopian theory or from within intentional communities, or they are picked up by communities from the outside-world and adapted or evolved, then are disseminated back into the outside-world where they may result in changes in the dominant culture. Three examples of this dynamic are: feminism, legal structures for communalism, and freedom from taxation. The correlations in community—Legal Structures: The Federation of Egalitarian Communities (FEC) was founded at East Wind Community the fall of 1976, and in 2017 Twin Oaks Community, another founding member of the FEC, then with about 100 adult members, celebrated its 50th year, breaking all records of longevity for secular communal societies in the United States. An important aspect of that success is the prior existence of a form of legal incorporation designed specifically for communal societies, set by the U.S. Congress in the Revenue Act of 1936, called 501(d) for “religious and apostolic associations.” The 501(d) section of the tax code was originally created for the Adventist community called the House of David in Benton Harbor, Michigan, which built an amusement park as its community business, beginning a tradition of exhibition ball games combining athleticism with comedy in their baseball and basketball teams, later copied by the Harlem Globetrotters (Tim Miller, 1998, The Quest for Utopia, p. 81). Along with various communal religious groups, many of the member communities of the FEC incorporate as 501(d) tax-exempt associations, except that Twin Oaks filed its taxes as a 501(d) organization for many years without obtaining formal recognition for the status from the U.S. Internal Revenue Service (IRS). About 1977 the IRS sent a letter to Twin Oaks saying that it was not exempt from taxes and would you please pay a quarter-million dollars in back taxes? For most communities such a letter would be a death warrant, except in the case of Twin Oaks which decided to take the IRS to court. The primary problem that the IRS identified was the “vow-of-poverty.” Catholic monasteries and similar religious societies incorporate under the 501(c)(3) tax-exempt status, which requires a vow-of-poverty, meaning that when people join they must donate all their assets and income to the monastery and receive none back, nor have any claim to the communal assets, when they leave the community. The IRS argued that when the 501(d) tax status was created in 1936 the U.S. Congress meant to include a “vow-of-poverty” clause. Not agreeing with this obviously contrived argument, Twin Oaks appealed the problematic IRS ruling to the tax court, and won the case in 1981! Since then many other communal groups, Christian, Hindu, and more, have incorporated as 501(d), while many others have been refused by the IRS. The problem now is that the Internal Revenue Code of 1954 states that a 501(d) organization must realize a substantial amount of its income from its own businesses and not from members holding jobs outside of the community and contributing their wages and salaries to the group’s common treasury. The IRS has never set a limit for the ratio of outside-job income to community-owned business income which will result in the denial of a community’s application for 501(d) status, which enables the IRS to use that rule to deny the tax-exempt 501(d) status to applicant communities which are not yet sufficiently established to have their own businesses. The solution to the problem of the limit for outside-jobs income versus community-owned business income was suggested by Herb Goldstein of the School of Living Community Land Trust. Goldstein sites the experience of the 1970s and ‘80s Christian evangelical Shiloh Youth Revival Centers which received a letter similar to the one that Twin Oaks received. Shiloh had been filing taxes under the 501(c)(3) status, which cannot receive income from jobs its members hold, which were unrelated to Shiloh’s exempt purpose, forcing the dissolution of the entire Shiloh community network. In a letter to the present author, April 10 of 1989, Goldstein explained that if Shiloh had formed a separate for-profit corporation to operate its businesses, allowable deductions would have created minimal tax liabilities. The suggestion is then that communal groups, especially new ones that do not yet have sufficiently established businesses to support the community and therefore need outside-work income, might set up two separate communal treasuries, one for community-owned 501(d) business income and the other for outside-job income. The second common treasury can be simply under a partnership agreement involving just those members who have outside-work income, or under a limited liability company, or other form of for-profit corporation. To the knowledge of the present writer, who is neither a lawyer nor a legal professional of any kind, no community has experimented with two communal treasures as explained here, and nothing in this document may be construed as legal advice for any group desiring to embark upon such an experiment, as this writing is only for informational purposes explaining various historical experiences and speculations as to possibilities. The correlations in community—Freedom from Taxation: LIVE • FREE! Labor Is Valued Equally • For Realizing Economic Equality! When all labor is valued equally, money is no longer used as inducement or reward for labor. When labor accounting is involved in time-based economies, an hour of work is equal to one “labor credit,” regardless of what is done or who is doing it. There are three forms of time-based economies: labor-exchanging, labor-gifting, and labor-sharing, and all three are tax-exempt. When labor is not valued in dollars and instead is only counted in units of time, the Internal Revenue Service (IRS) has ruled that time-based economies are tax-exempt. The IRS gives three reasons for labor-exchange systems like Time Dollars to be tax-exempt: 1. An hour is always an hour, regardless of what type of labor or productive work is involved; 2. Labor-exchange hours are backed only by a moral obligation and are not legally binding; and 3. The purpose of labor-exchanges is charitable. Labor-sharing is tax-exempt for generally the same reasons as labor-exchanging and labor-gifting above, even when used for income-producing labor making money in community-owned businesses, when the community is incorporated as an IRS 501(d) organization [see the previous discussion “The Correlations in Community—Legal Structures”]. There is, however, a limit to how much tax-free income a 501(d) community can make through its time-based labor system. The formula is: net income from community-owned businesses for a given year (with only a small percentage from outside jobs, although the IRS does not specify that percentage) ÷ total number of community members (adults + children) = less than the poverty level annual income where the tax rate is zero. The intentioneering of cultural innovations in utopian theory and communitarian cultures is often motivated by the desire among people to live in ways more consistent with their greatest values and highest ideals of personal responsibility for self, society, and nature than what the dominant culture offers or supports. As explained in section 12 “The Parallel Cultures of Exchange Economies versus Communal Economics,” the gifting and sharing cultures give rise to monetary economics, which became the “dominant culture” expressing the negative values of possessiveness and competition, while monetary economics similarly gives rise to countercultural systems of gifting and sharing representing the positive aspects of cooperative culture first learned in eons of tribal culture. Ever since the advent of money people have devised forms of time-based economies to escape the evils of monetary economics, including endless warfare, mass slavery, wealth amidst poverty, and environmental decline. When money is not used within a community, encouragement and reward for participation requires creative methods for expressing group affirmation and appreciation for the time and skills contributed by each person. Since there is no monetary reward for motivating work in the time-based economy, forms of positive reinforcement for contributing time in labor or work may include: • Personal satisfaction for doing work valued and appreciated by others, or which serves the common good; • Recognition by friends for one’s good work, especially when offered personally, and • Knowing that other members are also doing the best quality work they can for the community. This latter form of positive reinforcement results in a sense of group awareness and commitment, or ésprit dé corps to use a military term, which helps to avoid or decrease burnout, or the loss of the intention originally inspiring the individual due to the daily effort required to maintain commitment and participation. There is a large amount of sociological and psychological material about what motivates people, suggesting that “carrot and stick” approaches which inspire hope-of-gain versus fear-of-loss is not the most important concern. Daniel Pink explains in his 2009 book Drive: The Surprising Truth about What Motivates Us that once our basic survival needs are met, our greatest motivation for what we do is the resulting personal growth and development that we realize, toward expressing our individual human potential. The author analyzes the components of personal motivation as being first autonomy, or the desire to direct our own lives, then mastery, or the desire to continually improve what we do (and the more it matters to others the better), and also the desire to be of service to an ideal or something that is larger than just one’s own life. Alfie Kohn writes in his 1999 book, Punished by Rewards: The Trouble with Gold Stars, Incentive Plans, A’s, Praise, and Other Bribes that “artificial inducements” only work for a period of time, after which the lack of a meaningful context for what we do can cause people to lose interest in the bribes offered. Rewards can actually work against creativity as they discourage risk-taking when the safest way to earn a reward is to follow the methods designed and imposed by others. Kohn identifies the conditions for authentic motivation as collaboration with others, the meaningfulness of the work, and choice or self-direction, all of which can be provided in the social-economic-political design of intentional community. The thirteen correlations of theory and practice above present fundamental dichotomies in human culture. Many of these and probably others can also be written as ironies of human culture, yet however presented they may also be considered to be behavioristic principles of “natural law,” and together affirmed as aspects of the unified-field theory of communitarianism, or of the practice of intentioneering, as expressed in the application of our highest values and ideals in our chosen lifestyle. Natural law integrates in one coherent world view a set of moral principles for the design of spiritual, political, economic, and other social issues. These aspects of our existence at the juncture of the physical and the spiritual aspects of the universe justifies both common and private property by affirming respect for social, environmental, and personal responsibility in our applications of the laws-of-nature. These correlations of intentional community, or of intentioneering theory and experience, represent at least some of the psychological laws of behaviorism. These balance the group’s right to self-determination in creating its social contract, including a behavior code and a system of property ownership and/or control, against the individual’s subjective needs and wants. The individual’s participation in the mutual processes of decentralized, self-governance, toward common expressions of “the good life,” results in our cultural evolution through successive approximations of paradise on Earth. • Behaviorism (behavioral psychology) — A philosophical theory that all behavior ultimately results from external environmental influences upon, or conditioning of, the individual’s internal cognition, emotions, and attitudes. • Natural Law (political or religious philosophy) — A body of unchanging moral principles influencing human conduct, whether recognized through reason or revelation. The intentional communities movement has been growing since at least the Great Recession of 2008. The last time that there was such growth in alternative lifestyles in America and around the world was the late 1960s through the late ‘70s. The 1980s saw the “Big Chill” when the Baby Boom generation returned to main-stream culture and the communities movement quieted down. 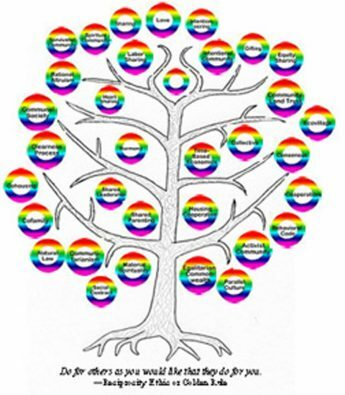 A regrouping began in the 1990s with the reorganizing of the Fellowship for Intentional Community (FIC or Fellowship; see: http://www.IC.org), while other earlier community networking organizations passed their energies to a new generation of organizers. The steady building progressing ever since has provided a foundation for the resurgence begun since 2008. Today we see not only the Baby Boomers organizing “senior cohousing,” yet the subsequent generations are also jumping into various other forms of intentional community. Youth always embraces alternatives to the dominant culture, which then influences the lifestyle choices of future generations, ever expanding the methods people use for building cultures outside of the mainstream, and for survival within the confines of the dominant culture. • Gen Z, iGen, or Centennials: Born 1996–TBD, coming of age as cofamilies and class-harmony community is ascending, while authoritarian Catholic monasticism is shrinking and other decentralized religious and spiritual communities are expanding. With a continually growing number of intentional communities adding to the listings in the Fellowship’s “Directory of Intentional Communities,” the tendency moving into the 2020s is for the clustering of either similar intentional communities, or of various different forms of community, in specific regions or local areas. The Fellowship provides a map showing where the hundreds of intentional communities listed in its directory are located, and from that one can see that most of those clusters are in and around urban centers, with some rural areas also showing countercultural clusters. Communitarian clusters are found at: The Big Island, HI; Seattle, WA; Portland, and Eugene, OR; Nevada City, Occidental, Davis, SF Bay Area, Los Angeles, and San Diego, CA; Tucson, AZ; Boulder/Denver, CO; Austin, TX; Black Mountain, NC; Minneapolis/St. Paul, MN; Madison, WI; Chicago, IL; Ann Arbor, MI; Louisa, VA; Washington, D.C.; Amherst, and Boston, MA. New York City should also be in this list because of its many old-wave housing co-ops, yet not many communities appear there in the FIC map. There are also areas where worker-owned, cooperative businesses are noticeably growing, including: Jackson, MS; Cleveland and Cincinnati, OH; NYC and SF Bay Area; and on some Indian reservations, particularly those of the Sioux. And there are many other areas with smaller clusters of sometimes similar and sometimes different forms of intentional community, although these are hard to see unless one lives in the area long enough to learn of them. Often these small community networks form and grow around a single large, successful intentional community. In fact, this model of a single large community inspiring the development of a cluster of satellite communities around it is an ages-old pattern, possibly begun around the time of the Ancient Greek philosopher and mathematician Pythagoras’ community called Homakoeion in what is now Italy in the 6th century B.C. , and later during the rise of Catholic monasticism through the Dark Ages of Europe. A similar pattern of a successful intentional community inspiring others nearby is developing today as we move into a potential 21st Century Dark Age. While it is not always the case, there is a pattern of youth seeking a different lifestyle than how they grew up. People growing up in the country are often drawn to live in the excitement of the city, while those growing up in the city idealize and romanticize living in the country. Generational oscillations between rural and urban lifestyles are also reflected in oscillations of the generations between mainstream and alternative lifestyles. The primary point being that people, especially youth, need and want options from which to choose how they are to live. What intentional community movements provide is choices, not only for changes of scenery yet also for changes in lifestyle, particularly from that of competitive, wasteful alienation to that of cooperative, sustainable, righteous living. A particular rural area that I believe has great potential through the future for the development of a cluster of alternative communities is the Ozark Mountains of southern Missouri. In the 1970s the Ozarks experienced an in-migration during the back-to-the-land movement of that era. It was here in Tecumseh Township of Ozark County that a “Walden Two” community was landed in 1974, inspired by the first successful Walden Two community called Twin Oaks in Louisa County Virginia, the two communities sharing the inspiration of Henry David Thoreau’s book “Walden: Life in the Woods” and B. F. Skinner’s utopian novel “Walden Two.” Today, nearly half-a-century later, another back-to-the-land movement is arising and while the existing community clusters are benefiting from it, new clusters may also develop, with the Ozarks being a likely location. I was twenty when I joined East Wind in 1975. At the time I was hitch-hiking around the country looking for the most promising communitarian society to join. I was thinking that I would go anywhere that I found a group of people developing what I felt was the most likely community to succeed and grow, and at the time East Wind expressed the goal of growing to 750 people. Some 43 years later East Wind is only at about a tenth of that goal, and may never decide to grow over 100 people, yet the idea of a large communitarian project of hundreds of people remains a good idea, and Tecumseh Township, Ozark County, Missouri remains a good place to do it! Just not as one large communal society, instead as a network of a variety of different forms of intentional community, all to be in close proximity. First, however; I think that the term “commonwealth” is a good one to use as it means simply the common wellbeing of a region with no specific economic design implied, although the political design would be “democratic decentralism,” as the Kurdish people in Rojava, Syria call it. Rojava in Syria and Catalonia in Spain are two places where the concept of democratic decentralism is currently being developed. A diversity of economic designs includes not only communal societies sharing commonly-owned property, yet also various forms of collective communities sharing privately-owned property, like land cooperatives or real estate investment co-ops (REICs). A third form of intentional community is the community land trust in which the land (and maybe some buildings and/or equipment) is owned in common via a nonprofit organization while everything else is private property. Ozark County is friendly toward intentional community since it has no building codes, and while land is not cheap it is less expensive than most places. There is a good amount of water with creeks and rivers flowing through the rolling hills, with dams and reservoirs creating recreational areas. The Ozarks is largely wooded with a great diversity of wildlife as it borders on several different ecosystems, including Kansas grasslands to the west, deciduous forest to the north and east, Mississippi wet lands to the southeast, Oklahoma desert to the southwest, and the Boston Mountains (up to about 2,500 feet above sea level) to the south in Arkansas. While the wooded hills provide wood and stone for building, there is very little level ground for agriculture. The most common agricultural commodity in the Ozarks, besides timber is beef. Fortunately, with hemp now legal it can be used to make another building material, hempcrete. The roots of the hemp plant can help stabilize the soil on hillsides, and it often grows well in poor soil. I can think of two possible drawbacks of living in the Ozarks, besides the lack of jobs. First is that since the entire region is largely wooded, the potential for devastating fires like those recently in California will become more of a problem as climate change advances. Fire breaks and other fire safety precautions, like water systems planned for fire-fighting, are necessities. Another concern is that the region is largely Republican, although as mentioned above the ability to make money in the Ozarks can ameliorate potential problems coming from that cultural difference to some degree. The Ozarks is part of the Bible Belt, and Christian survivalists and other “preppers,” or those preparing for the 21st Century Dark Age, are also flocking to the Ozarks. So it would be wise to avoid proclaiming the Tecumseh Commonwealth from the roof-tops, and instead to quietly buy land and start building. An important positive aspect of Ozarks culture is that for at least a century people have relocated to the Ozarks to get away from the dominant culture. For this reason the locals tend to live by the ideal of “leave me alone and I’ll leave you alone.” So in some ways Ozark hillbillies are, although not particularly welcoming, at least tolerant of their neighbors. Therefore, to be accepted it is necessary that new folks take care of themselves, bring ways to make money with them, don’t take jobs from the locals, don’t try to live on welfare, and most of all don’t try to influence the children of the locals. As long as communities create and enjoy their own culture on their own land, and for God sakes clean up before going into town to spend money, the local folks will be mostly friendly. Since I did my time pioneering a community at East Wind during my 20s, I personally do not feel the need to relive that experience, yet when I have the money I intend to invest it in Tecumseh real estate. There may come a time when I will be able to leave the city, and since East Wind is my home I think of living at least near the community again someday. Pioneering a homestead or a community is a job for young people, and as always, the Ozarks is a good place to do it! There are other ways for older folks like me to help besides chopping wood and carrying water, although I always will need the exercise! A new story for empowering women to a level of equality with men needs to include a chapter which evolves or transforms the dominant religion from patriarchy to gender-equality; as in a religious partnership of women and men. The most powerful and meaningful new story would then be that of the merging of male-oriented transcendent spirituality with the immanence of creation and grace in women’s spirituality. The drama in the story of replacing patriarchal religion is in avoiding a matriarchal religion and instead in balancing masculine and feminine aspects in a Partnership Spirituality. For most of the world, the dominant, patriarchal religion is the Abrahamic faiths of: Judaism (founded 19th century B.C. ), Christianity (1st century A.D.), and Islam (7th century A.D.). “The patriarchy” will not end as long as the patriarchal Abrahamic faiths are not replaced by a Partnership Spirituality. One of the many new stories that need to be told in order to work for equalitarian or egalitarian culture is how the early partnership culture was lost and how it is being reclaimed today. Religion can be a powerful force in culture for either conservative or for progressive influences, and so it is necessary to understand how it has been used to design the patriarchal culture, and how to utilize this force in order to direct the influence of religion toward the support of equality-of-the-genders, or egalitarianism. A place to begin is to realize that there are people who have constructed, and who are enjoying today, a culture of economic equality among women and men in the communal societies of the Federation of Egalitarian Communities. One of the ideals of the feminist movement has always been that of valuing domestic labor, including childcare, cleaning, food preparation, healthcare, and more, equal with income-generating and other work typically done by men, and this ideal in particular has been realized in the Federation communities. The idea of “wages for housework” came up in the first wave of feminist organizing around the time that women won the right to vote in America about a century ago. Yet what developed instead since then has been the turning of everything that people used to do for themselves in the home into commodities or services for purchase, essentially monetizing domestic work, which is one of the reasons women today have to work for income as well as work in the home, while many men have begun doing the same. While it is essential that men share the domestic workload, which does move us a step toward feminist, egalitarian culture, merely sharing the domestic labor burden does not result in valuing the two types of work equally. Child care is among the lowest paid occupations for those who work in it, while being one of the biggest expenses for those who must pay for it. The importance of knowing this story about gender-equality in communal society is the evidence shown that the ideal is attainable; egalitarian culture does exist, and anyone can learn about and enjoy it! The problem, of course, is that most people do not want to live in communal society. Frequently, young adults who individually join a Federation community will form a relationship, then leave to have children in the dominant culture rather than in the community where they met. I once did a survey of former members of East Wind Community, asking them why they joined and why they left, and the answers were most often that people joined for idealistic reasons, like to enjoy an ecological, feminist, sharing lifestyle, and left for practical reasons, like to go back to school, to pursue a career not available in the community, and especially to have children. Children-in-communal-society is a major issue among both religious and secular groups. The systems for communal childcare in the Federation communities have changed over time, from where during about the first quarter-century of the movement the communities, rather than the parents, made all decisions regarding the children through their childcare programs. However, the Federation communities found two major problems with communal childcare in large communities. First, the turn-over rate of members, both parents and non-parent care-givers, meant that issues like immunizations, discipline, diet, etc., that had been settled earlier invariably have to be re-debated as new parents come into the program, requiring ongoing meetings to continually reset or redesign a consensus. Second, the fact that many or most parents leave with their children before they reach school age results in reluctance on the part of some members of the communal group to fund birthing and childcare. In response to these and other issues, the Federation communities since the early or mid-1990s now empower parents in creating support systems for their children with the help of other individual members, rather than the community itself organizing childcare for the parents, which I think of as “cofamilies” formed around each child and nested within the larger communal society. The term “cofamily” is intended to add to the common list of types of families. The existing list includes: single-parent family, nuclear family, extended family, and blended families. While this list involves only people who are related biologically or through marriage, there is another form of family which needs to be acknowledged and added, which is groups of three-to-nine, usually unrelated and unmarried adults, supporting each other and their children. A cofamily is a form of small intentional community, with the prefix “co” in this case representing any number of terms including: cooperative, collective, communal, complicated, convoluted, or any similar term other than “consanguine family.” The term “cofamily” can refer to either a small group by itself, or to a small group within a larger intentional community, whether communal, collective, cohousing, land trust, ecovillage, or other. The classic problem of children and families in communal society is best explained by a quote from the Catholic Worker movement. In his book, “Breaking Bread: The Catholic Worker and the Origin of Catholic Radicalism in America” (1982), Mel Piehl quotes a Catholic Worker community resident named Stanley Vishnewski who clearly explains the dynamic. Although the Catholic Worker movement is now growing rapidly, it is mostly creating small communities or cofamilies of under ten adult members each, which can manage communal childcare for a few children at a time. When a Catholic Worker community grows to ten adults or more it will likely experience the problem with communal childcare that Stanley Vishnewski explained. The stories are different, yet the lesson is the same. This is why communities which share privately-owned property as opposed to sharing commonly-owned property, like cohousing, usually advertise for people with children while communal societies usually do not. This is also much of the reason why collective, rather than communal, community designs like cohousing and Catholic Worker communities are the fastest-growing community movements. The confusing thing is that many communities may function communally while the property is owned by an individual, which is a form of intentional community which I have named “class-harmony community,” some of which are Catholic Worker. While it is amazing that the egalitarian communities have existed for over fifty years, with their solution to the communal childcare problem being to limit the number of children they will support while providing for “nested cofamilies,” it is their turn-over rate of membership that keeps the movement to a slow growth-rate. After half a century there are fewer than 250 adult members of egalitarian, communal Federation communities while a few thousand people have been members, with the largest community, Twin Oaks, being about 100 adults. Twin Oaks Community appears to have adopted a decentralized model of about one-hundred adults per community while similar communities are founded around it, with a current maximum of one child for every five adults, which is slightly below the ratio of children-to-adults in the dominant culture of the “Outside World.” Understanding the membership turn-over rate, plus the fact that most all of the children born into these communities either leave with their parents by the time they reach school age or leave on their own once they become adults, suggests that this method of creating feminist culture is limited in application to the dominant culture. The value of communal, egalitarian culture is in showing the extent of the concept, or how the ideal of gender equality can be fully realized in the real world. While we now know how to create a culture that values all labor equally, by using forms of time-based economics, especially what I call the, “vacation-credit labor system,” we have to recognize that even after experiencing it most people simply do not want to live in communal culture, even though many idealize communalism. While many people talk anti-capitalism, most people abandon communalism once they experience it to return to capitalist culture, usually valuing their communal experience yet refusing to live it again once they acquire property and family. Theoretically, it is possible that a communal economy could work on a scale large enough that most people could satisfy their personal needs and wants, while the current strategy for getting there is the decentralized network of separate communal groups of up to a hundred adults each in close proximity. What communal culture shows us is that while the problems of capitalist monetary economics inspires people to step outside of the dominant, competitive culture to create communalism, the experience of living communally inspires people to want to return to capitalist competition, if only to see how well they can play the game! Ironically, both capitalism and communalism give rise to the other, as each engenders its own opposite. Besides in communal society, we can also see this dynamic in various festivals, like the Gatherings of the Rainbow Family of Living Light and in Burning Man and related events. While the people who attend such gatherings are committed to community and cooperation in their gifting cultures, there remains a strong tendency among attendees of Gatherings in national forests to spread a ground-cloth and offer items displayed upon it for trade in a sprawling “Barter Lane.” The resulting scene is of the ages-old, bustling, colorful, market ambiance that attracts many people to what I call, “wilderness training experiences in basic market economics,” practicing through barter transactions the market functions of: buy-low-sell-high, inflation in the cost of the most desired commodities of chocolate and tobacco, market deflation when someone brings a large bag of chocolate bars and hands them out, comparative advantage, rational self-interest, and other market dynamics all for fun and profit, enjoyed particularly among teenagers and younger children. While the Burning Man administration actively disrupts such Barter Circles, the much more anarchistic Rainbow Gatherings have been unsuccessful in preventing barter in our otherwise non-commercial events. Communal groups even end up using the monetary system for trading commodities among themselves. For example, East Wind Community makes peanut butter as a business while Sandhill Community makes sorghum sweetener and honey for their businesses, the two being about 300 miles apart in Missouri. For internal consumption both communities wanted the other’s commodities. They tried bartering the commodities, yet problems resulted in how to value the different items, whether by weight or labor involved, or some other method. Then too there was the problem that barter transactions are taxable, and so the communities had to value their products in dollars for sales tax reporting. And further, having a separate ledger for barter complicated the computations of productivity, dollar-per-hour of industry labor, and annual income tax reporting. The communities simply found it to be easier to sell their commodities to each other rather than barter them. Here again we see why monetary economics exists, and the difficulty for even communal societies to do without at least an alternative or local currency, which is an exchange system rather than a gifting or sharing system. One important and valuable function of time-based economics beyond the individual community is labor-exchange between communities. As long as labor is not given a dollar value, either within or between communities, it is not considered to be a commercial exchange, and therefore is ruled non-taxable by the IRS and other government agencies. By assuring that the community’s income is below the taxable level per person, a communal society can then be tax-free. Because the communities share so much internally it has been proven to be possible to live a lower-middle-class lifestyle on poverty-level income. Further, a time-based, communal economy avoids not just income taxes yet also, when incorporated as what the IRS calls a “religious and apostolic association” using section 501(d) of the tax code, communal groups are free of social security and unemployment taxes. From all of this I developed the acronym: LIVE FREE! Which stands for: Labor Is Valued Equally • For Realizing Economic Equality! Evidently, despite the economic freedom and feminist culture of egalitarian communalism, people have an innate desire for private property in family groups, for the excitement of meeting and trading in markets, and for efficient exchange mechanisms between communal groups. While people want to know that alternative cultures exist outside of monetary economics, few people, including those who experience it, choose to make it a lifelong commitment. The issues around children in communal-sharing societies, barter in festival-gifting experiences, and trade among communal societies serve to explain both why capitalism exists and why communalism can never become the dominant culture. The greatest value, then, of successful communal societies like those in the Federation of Egalitarian Communities, is in the model these communities present of egalitarian culture. The experience of these communal societies shows us the practical extent of the application of feminist, egalitarian culture as practiced in some communal societies in economics, governance, and the social design considerations of children and family. The next step, therefore, is to apply feminist, egalitarian culture to religion. In considering where to start in the creation of a Partnership Spirituality it is helpful to consider who is already doing something similar, and the largest such group is the Unitarian Universalists. Arthur Morgan served a time as the vice-president of the American Unitarian Association (from the back cover of “Edward Bellamy”), before it merged with Universalism in 1960, both originally being Christian denominations. Later in the 20th century three intentional communities in central Virginia were associated with the Thomas Jefferson Memorial Church Unitarian Universalist in Charlottesville, Virginia: Twin Oaks (1967-present), Springtree (1971-to present), and Shannon Farm (1972 -to present). Springtree and Shannon both started after their founders attended a summer Communities Conference at Twin Oaks Community. Early on, Twin Oaks had its own UU Fellowship, which carried on exchanges with the UU Church in Charlottesville, members of which helped Twin Oaks build a UU meeting hall with labor and money donations, called the Ta’chai Living Room. Over the decades various Twin Oaks members have attended UU services and other events in Charlottesville and at various UU churches in the Washington D.C. area. Notice in the timeline above of intentional communities and organizations that the Unitarian Universalist influence is an important part of the foundation of some of the movement, culminating now in the Fellowship for Intentional Community which publishes “Communities” magazine, the “Communities Directory” and other books, and sponsors conferences, trainings, consultations, a loan fund, a website, and other movement services. There are as well many other religious and spiritual organizations comprising the foundation of the communities movement, with the Quakers having the longest association with communitarianism, yet the point is that while religious sentiments often give rise to people wanting to live by their religious precepts, which results in the founding of utopian societies, all of that already exists with regard to egalitarian, feminist culture. Effectively, Partnership Spirituality works in the opposite direction, with the creation of egalitarian culture having been completed first and its religious expression following. Merging an egalitarian expression of Christianity with women’s spirituality in a form which could be affirmed as being not so much polytheistic as it would be a binarian monotheism would involve extensive dialogue and deliberation, and so Unitarian Universalists would be the perfect group to carry on the idea of a Partnership Spirituality. In the same way that Trinitarian Christianity (i.e. : Father, Son, Holy Spirit) is considered to be monotheist, so also may a Binarian Partnership Spirituality of male and female (or any other genders) be considered monotheist when affirmed as one entity. That is, we say it is so, then for us, so it is! Such is the malleable nature of spiritual and religious beliefs. It would be well that Twin Oaks Community and other groups utilizing the 501(d) tax status consider taking one of its primary organizational tenants, which is feminist egalitarianism, to an affirmation of a religious belief, because having a spiritual or religious orientation is a requirement of that favorable tax status. We know that the IRS and conservative government in general has a bias against communalism, and any time these conservative forces desire to do so they can challenge again Twin Oaks’ claim to meet the requirements of the 501(d) Religious and Apostolic Association, as they did in the late 1970s. I have since suggested that this separate bank account plan could and perhaps should be used by especially new communal groups that have a significant amount of income from outside jobs as opposed to community businesses. While the community business income is exempt under 501(d), outside job income is not. Therefore, having two separate community bank accounts, one exempt for community-business income and the other non-exempt for outside-work income with the two taxed differently, would likely facilitate a new community’s application for 501(d) status, yet that is a another issue. There may come a time when Federation communities will want or need to dust off their statements of religious belief which they have filed with the IRS and make witness of their lifestyle as justification for their claim that they are indeed religious organizations. Both East Wind and Twin Oaks include in their statements of religious belief the quote from the Book of Acts in the Bible about all believers holding property in common, along with various ideals about sharing and oneness. Yet the most prominent aspect of their existence and structure is egalitarianism, and so adding the equality of women and men as another aspect of their stated religious beliefs could make Partnership Spirituality a saving grace for them. Riane Eisler’s Partnership Center would likely be an excellent resource for Unitarian Universalists and others in the creation of new stories of partnership culture and spirituality. A New Age of Partnership, however will require more, it will need a new Bible, and for that I have written an alternative history of gifting and sharing societies through the ages, focusing upon tribal and communitarian cultures, with an emphasis upon women’s stories in them. This work is currently only available in digital format at Amazon.com titled “The Intentioneer’s Bible: Interwoven Stories on the Parallel Cultures of Plenty and Scarcity.” Much of the material in this article is also in that book. Having a good start on a history of gifting and sharing cultures, as opposed to the taking and exchanging of the dominant culture, another potential resource would be a video documentary of the history portrayed in “The Intentioneer’s Bible.” And who better for such a project than the Public Broadcasting System (PBS) documentarian Ken Burns! Perhaps PBS is not exactly a Hollywood-level story-teller, yet the difference in emphasis and orientation likely makes PBS more appropriate for telling the story of egalitarianism through the ages, toward a transition of our civilization from patriarchy to partnership. Berry, Brian. (1992) America’s utopian experiments: Communal havens from long-wave crises. Hanover, NH: University Press of New England. Fiorenza, Elisabeth Schussler. (1989). In memory of her: A feminist theological reconstruction of Christian origins. New York: The Crossroad Publishing Company. Fogarty, Robert. (1980). Dictionary of American communal and utopian history. Westport, CT: Greenwood Press. Hine, Robert. (1953). California’s utopian colonies. New York: Norton & Company. Huntington, Gertrude Enders. (1981). Children of the Hutterites. Natural History. Feb., vol. 90, no. 2. Isralowitz, Richard. (1987, February). The influence of child sleeping arrangements on selected aspects of kibbutz life. Kibbutz Studies, no. 22. http://www.communa.org.il. Miller, Timothy. (1998). The quest for utopia in twentieth-century America, volume 1: 1900-1960. Syracuse, NY: Syracuse University Press. Morgan, Arthur. (1942). The small community: Foundation of democratic life. Yellow Sprigs, OH: Community Service, Inc.
Morgan, Arthur. (1944). Edward Bellamy: A biography of the author of “Looking backward.” New York: Columbia University Press. Near, Henry. (2003). Intentional communities in Israel-history. In Karen Christensen and David Levinson (Eds. ), The encyclopedia of community: From the village to the virtual world: Vol. 2. Thousand Oaks, CA: Sage Publications. Oved, Yaacov. (1988). Two Hundred Years of American Communes. New Brunswick, NJ: Transaction Inc.
Piehl, Mel. (1982). Breaking bread: The Catholic Worker and the origin of Catholic radicalism in America. Philadelphia, PA: Temple University Press. Quoted in Berry, Brian J. L. (1992). America’s utopian experiments: Communal havens from long-wave crises. Hanover, NH: University Press of New England. Saxby, Trevor. (1987). Pilgrims of a common life: Christian community of goods through the centuries. Scottdale, PA: Hearld Press. The Bible: People Just Make This Stuff Up! My family had been attending a Congregationalist Church in NE Ohio for a couple years. I liked this church because Congregationalists comprise a liberal denomination where the members make all church decisions by voting, with no or little denominational hierarchy. My family would assume the same seating arrangement in the same row of the pews every Sunday, with my father at the aisle-end of the pew, then my mother, my older sister, and then myself, the youngest. Yet of course my sister and I would invariably start fighting during the sermon, so my parents soon changed our seating arrangement so that I took the aisle seat, then our parents, then my sister on the inside, furthest from me. I liked that arrangement better. Our minister taught religion in a local liberal arts college, and I tried to follow his sermons, yet most of the time I just could not understand what this guy was saying. His name was Royce Grunler, professor of religion at Hiram College around 1970. I would focus on the sentence he just said to try to figure it out, yet he would then go on to something else and I would forget what he said a second ago. It was hopeless. I would look at the studious expression on my father’s face and wonder whether he understood any better than I did what this college professor was preaching. As a high school freshman I already had more education than my father ever had, so I figured there was not much help there. This is where, like in school, I got the habit of staring at the instructor with a blank expression while my mind wandered around the room and the universe. What else could I do? I decided that to pass the time I would read my copy of the Bible that I took with me to church each week. No one would criticize me for reading the Bible in church, right? So I started from the beginning of Genesis, and it was all stuff I had heard about in Sunday School before the main sermon each week, until I got to Genesis 6:4. Wait a minute, I thought, no one ever told us this story before. What was that? What the heck is Moses, the supposed author of Genesis, saying in this passage? I could not make sense of it, so like everyone else, I guess, I skipped over this passage and kept going until I just could not slog through reading any more of the Bible. I tried, I really did. Yet I was soon back to staring blankly at any talking head trying to get and keep my attention. For many decades after that I didn’t think much about those giants in the Bible. Yet I never really forgot about them. Somehow, that speed bump in Genesis remained in my brain, until decades later, nearly half a century after I first read that passage, it finally dawned on me what was going on! Think about it! The year is sometime after 1,290 B.C. (different people give different dates) and you and your starving and increasingly demoralized tribe come upon these huge fossilized bones, some of which look like gigantic human leg or rib bones, and you, being Moses or some Levite priest, are being besieged by your tribe-mates saying that YOU have to explain what the heck these things are! What are you going to say?! You don’t know anything more than anyone else in your tribe about paleobiology and fossilized dinosaur bones. You can pray for enlightenment, yet in the end as always you just have to make something up! Of course those gigantic bones had to be from human-like male giants, right? There could not be giant animals or, God forbid, giant humanoid females! So they must have had something to do with our past, and maybe we can get away with using these crazy-huge, bone-looking, rock-like things to explain where our mythical larger-than-life cultural heroes must have come from! And that is how you write a Bible! You just make stuff up! If you are smart about it you claim that your writing was actually the words of someone famous, like Moses, which is called “pseudepigraphal” writing. Some scholars think that the character Moses himself was actually a mythical Hebrew law-giver. “Pseudonymous” literally means “falsely named.” See Bart Ehrman’s book, “Forged: Writing in the Name of God—Why the Bible’s Authors Are Not Who We Think They Are” (especially pages 23-25). For example, the fifth book of Moses called “Deuteronomy” was not written in the time of Moses, sometime in the century after 1300 B.C. In his book “Who Wrote the Bible?”(pages 101-2, 147) Richard Friedman says that Deuteronomy (the name being derived from the Hebrew term for “words” referring to Moses’ words) was actually written much later in the 5th century B.C., by a scribe named Baruch son of Neriyah, probably assembling material from many different sources, which is common for writings attributed to historical and mythical law-givers and philosophers. For another example, King Solomon, who supposedly wrote the Old Testament Book of Ecclesiastes, which some people say means “speaker” or “preacher” in Greek, may not have gotten the wisdom written in the book directly from God, instead from other much more ancient cultures by way of his 1,000 wives and concubines, many of them given to him as tribute from folks such as the Egyptians and Phoenicians. Some 1,200 years after the time of Moses the now fat and happy Jews of Israel are occupied by the greatest imperial power the Mediterranean region had ever seen. Unrest against those guys occupying your capital and temple is growing, and you need a savior! Now here comes this counter-intuitive movement of peace, love, and liberation from groups such as the Nazarenes, Essenes, Stoics, and Zealots, all needing a hero to rally around. So they constructed a savior-myth, named him “Jesus” after some itinerant healer, and claimed that he met on a hill top, to be called the “Mount of Transfiguration,” with the long-gone prophet Moses the law-giver who died and was buried, and with the prophet Elijah the spiritual leader who did not die instead was taken to Heaven alive in a fiery chariot. (See: Matthew 17:1-8; Mark 9:2-8; Luke 9:28-35 ) This meeting makes Jesus greater than both of the earlier prophets since he is now vested with the attributes of both a political and a religious leader. So next they made stuff up about how everyone has to believe in the divinity of their character Jesus or else spend eternity in Hell. Thirteen of the twenty-seven books of the New Testament, or about half, are said to be written by Paul, while four to six of those are thought to be pseudepigraphic. Paul and others are writing all that stuff in order to broaden the appeal of their peace, love, and liberation faith to non-Jewish “gentiles,” yet the problem is that the gentiles want to know about the early life of the mythical savior Jesus. Oops. We forgot to document the mythical Jesus’ early life story, so now we have to go back and make that stuff up sometime between 30 and 60 years after the events supposedly occurred! To confirm that’s how it happened, Marcus Borg arranges the books of the New Testament in the order in which they were actually written, in his book titled, “Evolution of the Word.” It turns out that seven of Paul’s books were written before the Gospels Matthew, Mark, Luke, and John which provide the story of Jesus’ life, even though in the New Testament the Gospels appear first. Revelation, the last book appearing in the New Testament projecting events in the “End Time,” is actually the fifteenth book written out of the total of twenty-seven. Chronologically, the last book written and included in the New Testament is Second Peter. Bart Ehrman says on page 23 in “Forged” that “one-third of the New Testament books . . . are books who’s authors never identify themselves,” including Acts, Hebrews, and 1, 2, and 3 John. The four Gospels never identify their authors, so they were later named “Matthew,” “Mark,” “Luke,” and “John.” I don’t suppose it really matters who wrote all that stuff if it is all made up anyway. People begin writing all kinds of crazy apocryphal and apocalyptic stuff, so you choose the writings you like and claim the rest is heretical, put your choices in something you call the “New Testament,” ban and burn the rest, and soon this rebellious religion takes over that imperial power to become the “universal” religion to which all must profess adherence or die. And that is how history is written. You need to justify your wealth and power so you just make stuff up that will do the job for you! Now, 2,000 years into the “Year of our Lord,” we have a global civilization with existential threats to our fat and happy civilization coming fast and furious. Lots of things have and are changing as life for most animals and many humans becomes more difficult. Most of us are not cold-blooded reptilians unaware of the rising temperatures around us; we can see what is happening and why. People like Riane Eisler point out that the problem slowly began 5,000 years ago with the change from a “partnership culture,” in which there was a balance of feminine and masculine traits in human society, to a “dominator model” in which by dominator-culture injunction men began to rule the lives of women and to “take dominion over the earth,” including wantonly despoiling it. Soon all life was no longer considered sacred as previously women’s spirituality and many indigenous cultures believed, becoming instead a resource for plundering by a conceptual construct we call “monetary economics,” which has now grown to a globally-exploitative system. Recognizing that morality and religion are contrived constructs, according to the values of the culture, Partnership Spirituality affirms that we can today create a religion of our choosing, as people have done in the past. I don’t think that our knowing that religions are simply made up by priests says that we need to be atheists or agnostics, because that ignores the positive role that religion can have in society. Religion is a tool of cultural self-determination, just like government, economics, education, technology, and everything else, and like the rest it needs to serve the people, not oppress us and destroy our environment. We either control our own lives, or leave it to others who will do it for us. The year 2027 will be roughly the 2,000th anniversary of the beginning of Jesus of Nazareth’s ministry, which he began at his age of 30 years. Whether he was an actual person or not, all sorts of people through the last two millennia have piled all kinds of stuff upon that name to create patriarchal Christianity, particularly Paul. 2027 will be a good opportunity for proclaiming the non-patriarchal, egalitarian religion of Partnership Spirituality. While many Christians have evolved from the idea of having dominion over the earth to the idea of humans having responsibility for stewarding creation, reverence for the life-giving aspects of nature has always been a primary aspect of women’s spirituality. Traditionally, it has been said that while God is love, the Goddess is wisdom, so by elevating the feminine principle to parity with the masculine in our culture we may best affirm the wisdom of sustainable ecological lifestyles and cultures. Today we are in transition between the astrological ages of Pisces and of Aquarius, and it is to us to re-myth our cultural foundations and personal beliefs as we choose. I choose to call a reclaimed gender-holistic religion “Partnership Spirituality,” while you may call it whatever you like. You can be engaged or not in the creation of the New Age, helping to make up this partnership religious stuff as you wish. For my part, I have written a tome to be used as a bible for Partnership Spirituality, available on Amazon.com titled: “The Intentioneers’ Bible: Interwoven Stories of the Parallel Cultures of Plenty and Scarcity.” Much of the material in this article is also in that book. May it serve as a foundation for the evolution of Partnership Spirituality. Borg, Marcus J. (2012). Evolution of the Word: The New Testament in the order the books were written. New York: Harper One. Campbell, Joseph. (1988). The power of myth: Joseph Campbell with Bill Moyers. New York: Bantam, Doubleday, Dell Publishing Group. Ehrman, Bart. (2011). Forged: Writing in the name of God—Why the Bible’s authors are not who we think they are. New York: HarperCollins. Eisler, Riane. (1987). The chalice and the blade: Our history, our future. San Francisco, CA: Harper & Row (1988 edition). Friedman, Richard E. (1987). Who wrote the Bible? San Francisco, CA: Harper Collins. Gimbutas, Marija. (1999). The living Goddesses. Berkeley, CA: University of California Press. Stone, Merlin. (1976). When God was a woman. New York: Harcourt Brace.